Blueberry Scones, whole wheat and no sugar added. 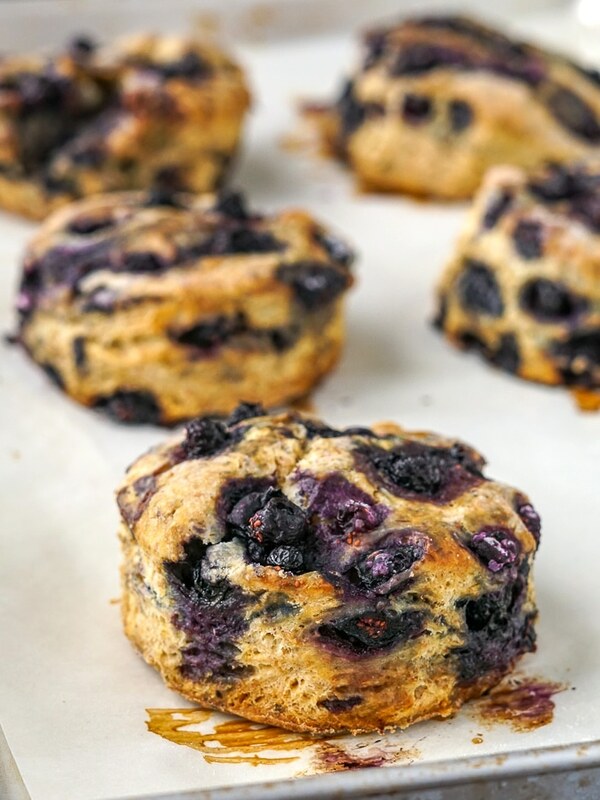 Blueberry Scones using whole wheat flour and with no added sugar; wholesome and delicious and with all those naturally sweet berries, you won’t miss the refined sugar one little bit. Blueberry Scones, don’t forget the butter! This particular version of blueberry scones is one I made just for Spouse. She’s always been partial to our recipe for No Sugar Added Raisin Scones, which is actually more akin to a Newfoundland Raisin Tea Bun. She says she likes these blueberry scones because they are more like Buttermilk Biscuits with fruit. 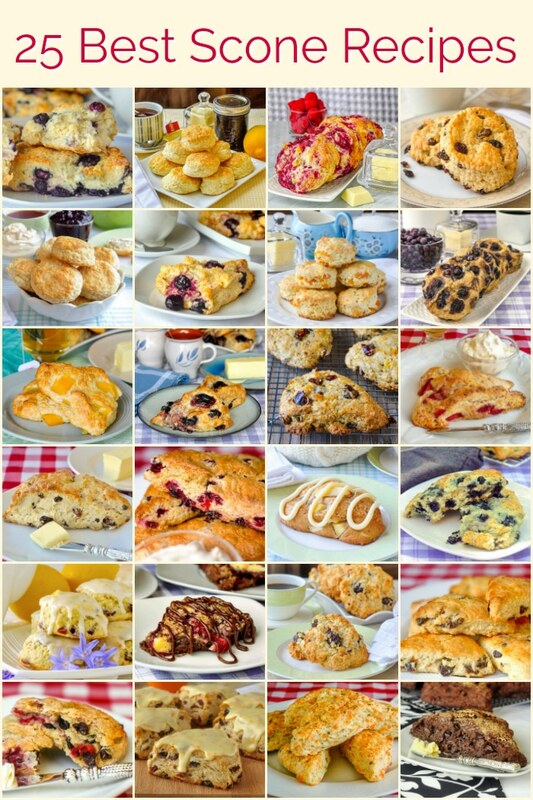 It makes sense that if the little pockets of sweet berries or dried fruits are scattered evenly throughout the scone, then they can serve as the sweetening agent for the entire scone. 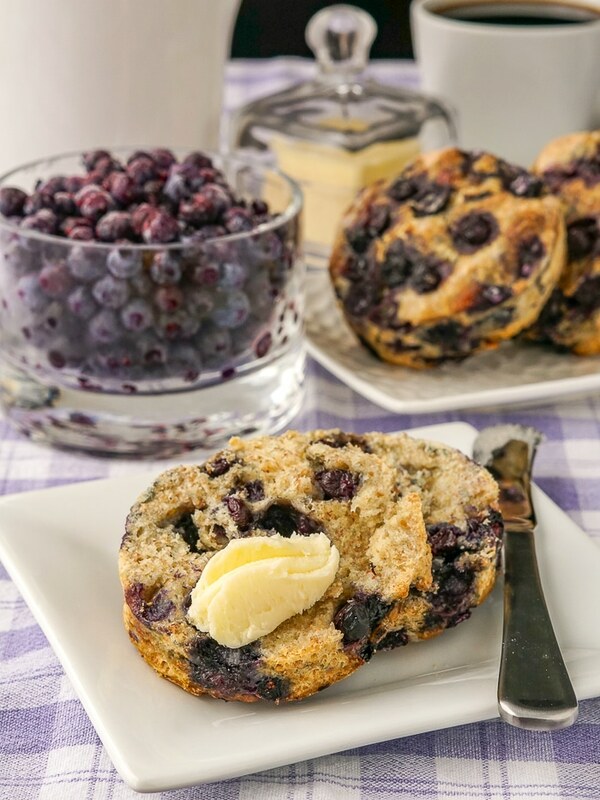 Tiny pieces of butter should still be visible in the dry mix for these Blueberry Scones. In tasting these blueberry scones, I also came to the conclusion that the natural flavour of the blueberries really does shine though better. Too much sweetness can mask their natural flavour. I’ve written many times here on Rock Recipes about our native wild Newfoundland blueberries, which I think are the best in the world. Just like I wrote in a recent recipe for my new favourite Low Sugar Blueberry Lime Jam, the blueberries just taste so much better without a lot of sugar. Add the berries to the scones, just before all the flour becomes incorporated into the dough. Use any type of whole wheat flour you like for these scones. I made them twice, once with 100% whole wheat flour and once with 60% whole wheat flour. Both were incredibly delicious, but the 100% whole wheat version rose just a bit less. I’ve kept this recipe a little on the smaller side but I have often doubled very similar recipes with zero problems if you plan on making more. Blueberry Scones ready for the oven. 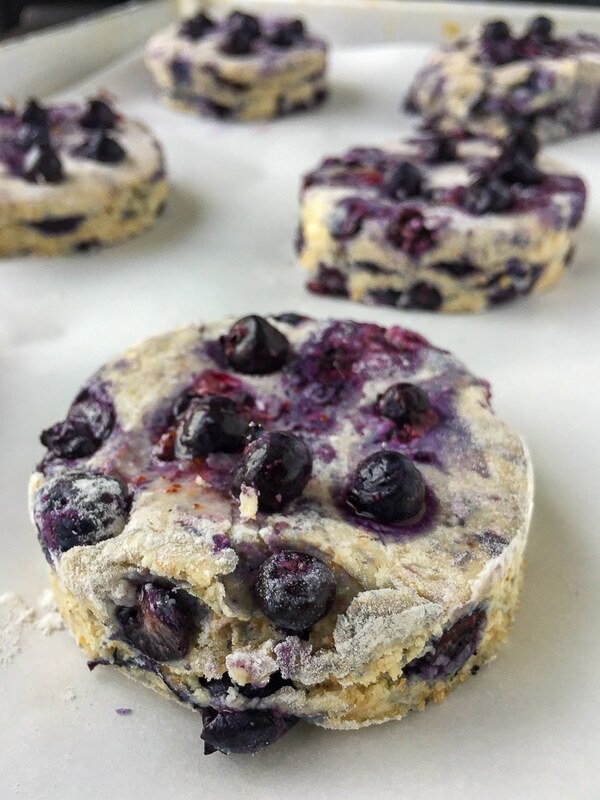 These blueberry scones freeze quite well and I love to warm them in the oven on weekend mornings. My method is to preheat the oven to about 300-325 degrees, wrap the scones in a single layer in aluminum foil. I them pop them into the oven for about 15 minutes and they come out practically as good as fresh baked. You’ll definitely want to try that trick and enjoy warm scones with melting butter practically any time you like. 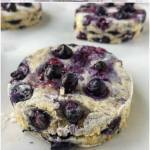 Like this Blueberry Scones recipe? 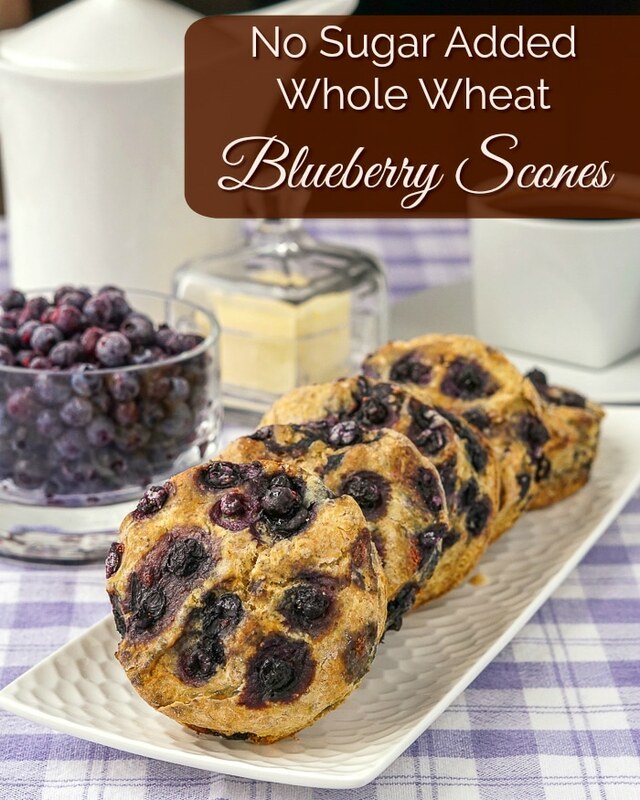 Blueberry Scones using whole wheat flour and with no added sugar; wholesome and delicious and with all those naturally sweet berries, you won't miss the refined sugar one little bit. If using a food processor, transfer the flour & butter mixture to a large bowl. Whisk together the milk, egg and vanilla. Add the liquid to the dry ingredients and stir in quickly with a wooden spoon until a soft dough forms. It should be a little sticky. Don’t over work the dough or your scones will get tough and not rise well. 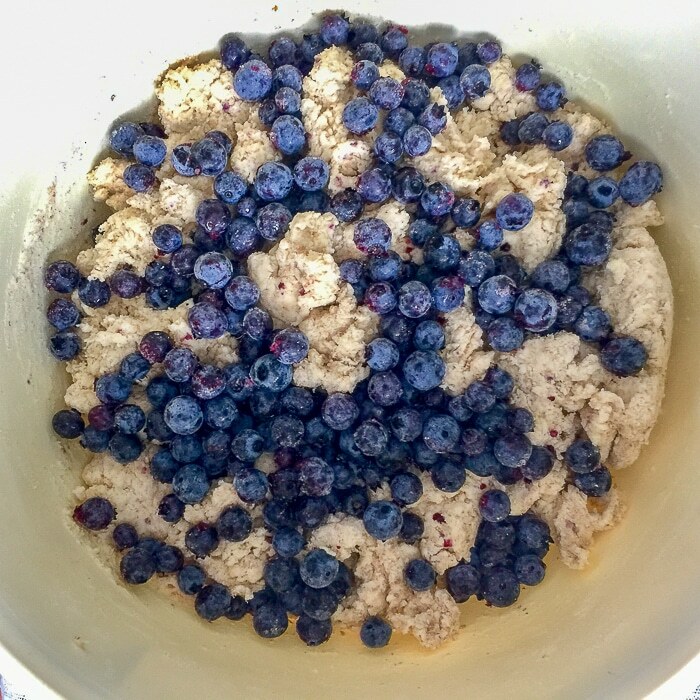 When the flour is almost incorporated into the dough, add the blueberries and work them in quickly but gently. Turn the dough out onto a well floured board or counter top. 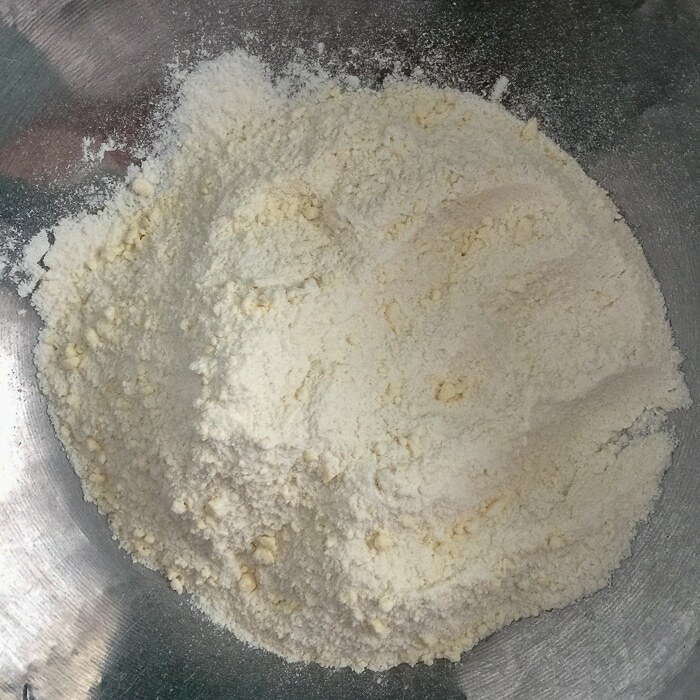 Sprinkle the top of the dough well with flour and just using your hands, form the dough into a round about ¾ of an inch thick. Using a large biscuit cutter, cut out your scones and place them about 2 inches apart on a parchment lined baking sheet. Re-roll the scraps and cut out the rest of the scones. Pop the scones into the hot oven for about 20-25 minutes or until the tops of the scones are evenly browned. Cool on a wire rack. Serve with thick or clotted cream or butter. Note, use any type of whole wheat flour you like for these scones. I made them twice, once with 100% whole wheat flour and once with 60% whole wheat flour. Both were incredibly delicious but the 100% whole wheat version rose just a bit less. I've kept this recipe a little on the smaller side but I have often doubled very similar recipes with zero problems if you plan on making more. 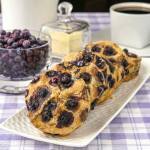 These blueberry scones freeze quite well and I love to warm them in the oven on weekend mornings. My method is to preheat the oven to about 300-325 degrees, wrap the scones in a single layer in aluminum foil. I them pop them into the oven for about 15 minutes and they come out practically as good as fresh baked. You'll definitely want to try that trick and enjoy warm scones with melting butter practically any time you like.